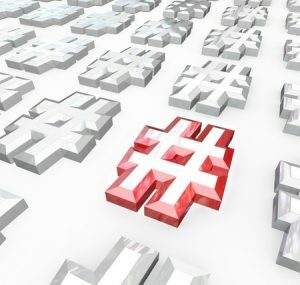 Hashtags are all the rage nowadays, and if you aren’t using them it seems you are the minority. From your own personal photos to businesses using hashtags, everyone is embracing the trend and taking advantage of it. But here’s the thing, did you know there is a science to using the hashtags correctly? This means you may not even be using them correctly. So, let’s break it down and make sure you are using them to their fullest extent. Just in case you’re new to hashtags and haven’t used them before, a hashtag is a word or grouping of words with the “#” sign in front of them. It would look like this: #hashtags. A hashtag is meant to categorize your content that is posted on social media such as Instagram, Facebook, Pinterest, and Twitter. It makes your content easy for others to find, as they can perform a search by the hashtag. While there is no rule set in stone about how many words you can string together in a hashtag, it is advised you don’t go overboard. When you string too many words together you make it hard to read, and the likelihood of it being searched for is much less. You can even end up losing followers over it as they can become annoyed with hashtags that don’t seem to make sense. Another tip is to customize your hashtags so that they make sense on that particular social network. For example, you may use a particular hashtag on Twitter that makes sense and is relevant, but may be out of place on Pinterest. If you’re having a hard time finding social network specific hashtags, you can always perform a search on tags you may think will work and see what pops up. It can become really boring really fast if you stick to the same hashtags each and every time. It’s important to change them up, be creative, and give your followers a reason to read your posts. Hashtags that are witty, smart, and fun can be the best ones to use. If the content is of a more serious nature, make sure you are encapsulating the topic to its fullest extent in the least words possible. There are plenty of hashtags out there that are “branded” in a sense, meaning large amounts of people use that same hashtag. There is nothing wrong with thinking outside the box, getting creative, and creating your very own hashtag that hopefully starts trending. By using these tips, you will be able to get out of your hashtag rut, likely increase your followers, and start generating interest in your posts on social media. If you are brand new to hashtags, there is no time like the present to jump in and get started.